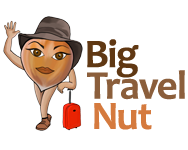 Despite the fact that I was born in Montreal, grew up in the region, lived there during university, and still visit at least twice a year, I recently realized that, shockingly, BigTravelNut does not contain a single post about that city! So during my recent visit, I decided it was high time to remedy that. First, a warning: I do not suggest that you attempt to visit Montreal in one day. However, if a day is all you have, here is how I recommend you spend it. If you enjoy exploring cities on foot, I think you will like this itinerary. Ensure that you’re wearing comfortable shoes and take along some water. The total distance covered is around nine kilometres (about five and a half miles). If you’re not comfortable walking this far, you may want to do only half the walk, and complement this with a half-day organized bus tour. Notes: In Montreal, the street grid system is oriented at an angle from the cardinal points. Hence “west” is in reality towards the south west, and “east” towards the north east. Walking “north” means walking away from the St-Lawrence River, and “south” means towards it. This is also the way I’ll describe directions in this article. By the way, “rue” is French for “street”. The walk starts and ends at a metro station. Numbers next to attractions correspond to those on the map at the bottom. Get off at Place-d’Armes metro station in Old Montreal and walk south to Notre-Dame Basilica  (facing the square called Place d’Armes) whose construction, in Gothic Revival style, was completed in 1843. The interior decoration has changed over the years, and now includes a bronze altarpiece, a Casavant organ, and unique stained glass windows among its features. It costs $6 to visit the inside, which is money well spent. 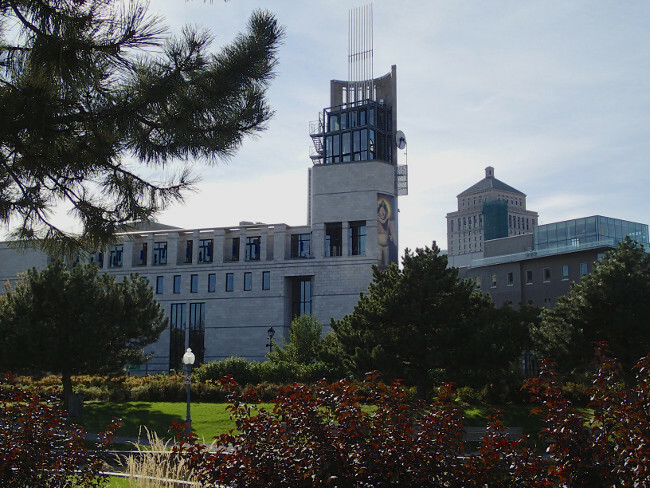 Next, keep heading south to the Old Port  (riverfront) with perhaps a detour to the Musée Pointe-à-Callière  (archeology and history museum) directly to the south west. This museum opened in 1992, but its modern building sits on top of ruins dating back to the beginning of the settlement in 1642. The adult admission price is $20, a bit steep, but if you like museums you shouldn’t miss this one. Once on the waterfront, if the weather is nice, sit in the park just across the pedestrian walkway, and indulge in some people watching. Cruise ships sometimes dock here. Once you’ve soaked up the atmosphere, walk east along the water and you’ll find the Centre des Sciences de Montreal  (Science Centre) on your right. An IMAX theatre is also located here. You’ll have to fork out $10 for the exhibits and $11.50 for an IMAX movie (more for combos), but it could provide a good diversion in rainy weather. You can venture out a little further along the water if you wish before doubling back. Turn back north, walk up St-Laurent Street for a block, then take a right on St-Paul. 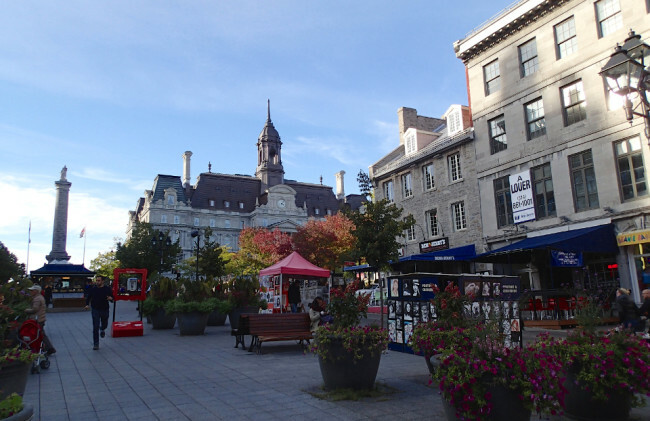 You’re now in the heart of Old Montreal , where the city began in the mid 17th century. Try to ignore the tourist hubbub and look-alike souvenir shops, and focus instead on the old stone architecture. You’ll soon come across Les Délices de l’Erable, a café that specializes in maple products. If you’re feeling peckish you could have a maple gelato, or a maple latte with a maple pastry. You could also buy a small jar of maple syrup, jelly, or butter as a souvenir. Keep walking east on St-Paul and you will emerge on Place Jacques-Cartier , where tourists mingle with buskers, caricaturists, and vendor stalls. It’s awfully touristy but there is a nice atmosphere. Just resist the urge to eat in the tourist restaurants. Turn left into the square and walk toward the column. The building you see up ahead and slightly to your right is City Hall  . Between it and the other imposing civic building to the left is a nice plaza with a showy fountain where you can sit down for a bit and rest. When you’re ready, keep walking north across the grassy area (Champ de Mars), then up Avenue Hotel de Ville . You’ll see downtown skyscrapers in the distance on your left, and then traverse a residential area where the buildings have outdoor stairs and ivy creeping up the walls. After a few blocks (and crossing busy Boulevard René-Lévesque) you’ll arrive at rue Sainte Catherine , the main commercial artery. Turn right and walk a few blocks to rue Saint-Denis, the city’s francophone entertainment district. Make a left turn on that street. The tall steeple you see on your right doesn’t belong to a church but to a building of UQAM (Université du Québec à Montréal) one of the two French universities in town. 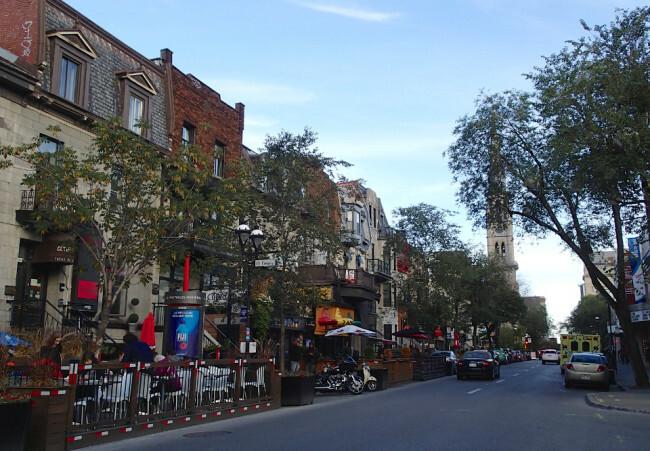 Montreal is a multi-cultural city, and rue Saint-Denis  reflects this, with restaurants and cafés serving different ethnic cuisine: French, Italian, Spanish, Mexican, Thai, Korean, Japanese, Vietnamese, Lebanese, you name it! Pick a place, rest, and enjoy a long lunch, like the locals do. (Not hungry yet? That’s OK, there will be more opportunities in a little while.) I used to frequent St-Denis for nightlife during my university days, but I don’t recognize my old bars anymore. Other than restaurants, the street houses a few quirky shops, such as independent bookstores, a cigar shop, a psychic, and a cat café! Once re-energized, keep walking up the slope just past rue Sherbrooke. On your left is Square Saint-Louis , a pleasant tree-shaded neighbourhood park anchored by a fountain. The architecture of the surrounding buildings is also interesting to look at. 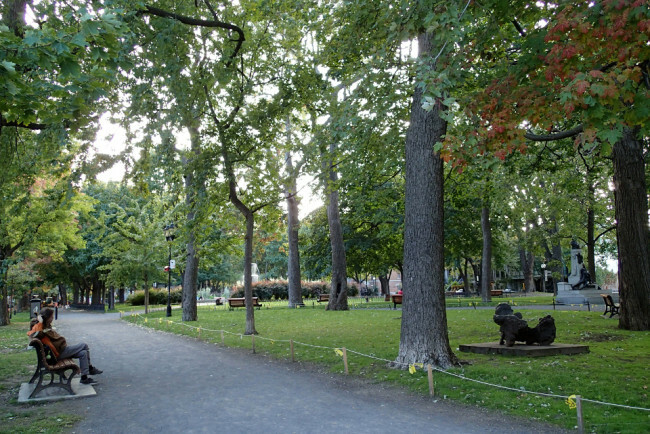 At the far end of the park you will find rue Prince-Arthur , a lively pedestrian street lined with restaurants. During the warm months, tables spill out in front of the restaurants, while buskers and portraitists entertain the crowd. The most loved characteristic of these establishments is that they generally let you bring your own wine! You can buy a bottle at a nearby convenient store (they all sell alcohol in Quebec) and have it with your meal, without having to pay a corkage fee. Walk the entire length of the pedestrian section, then turn right onto Boulevard Saint-Laurent. If you’re a chocolate aficionado, you may want to have a look at Juliette & Chocolat (3601 Saint-Laurent) before going any further. 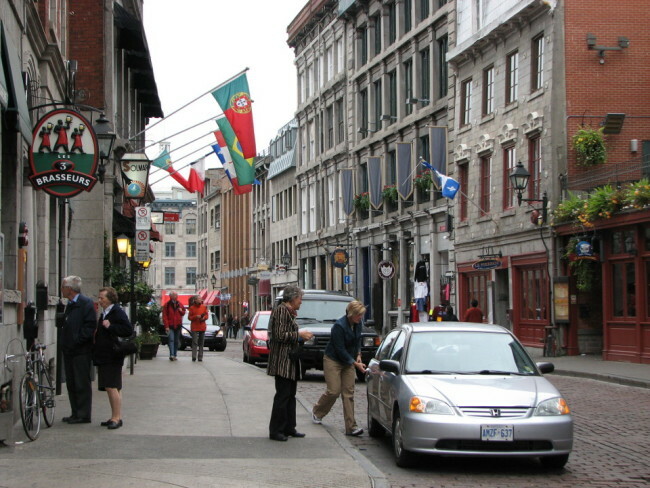 Boulevard Saint-Laurent , nicknamed “La Main”, divides the city between “East” and “West”. Keep your eyes peeled for the occasional mural (turn around once in a while – some will be behind you), and the famous Schwartz’s Deli (3895 St-Laurent), serving smoked meat sandwiches since 1928. If you haven’t had lunch yet, you could do worse than stopping here. One more block and you’ll come to Avenue Duluth. Take a left here and walk three blocks until you see a large park on your right. This is Parc Jeanne-Mance , a wide grassy area with a bohemian vibe, popular with young people who sit around to picnic, smoke, and play guitar. 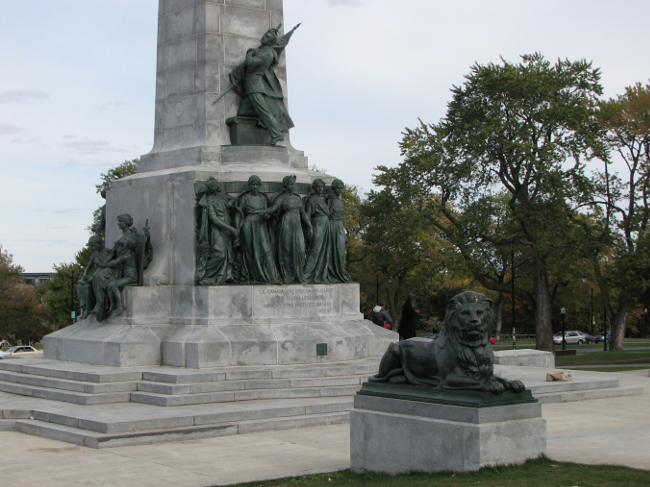 Cross the park along a diagonal until you see, across Avenue du Parc, the tall Sir George-Etienne Cartier monument , fronted by two lions. If it’s a warm Sunday, you will probably hear the drummers before you see them. The Tam Tam Jam is a Montreal tradition, a weekly festival of sorts, where people gather to play drums and dance in general merriment. Next, we head for the mountain and a climb above the city! Mont-Royal, Montreal’s namesake mountain, is a single hill of volcanic origin protruding in the middle of town. 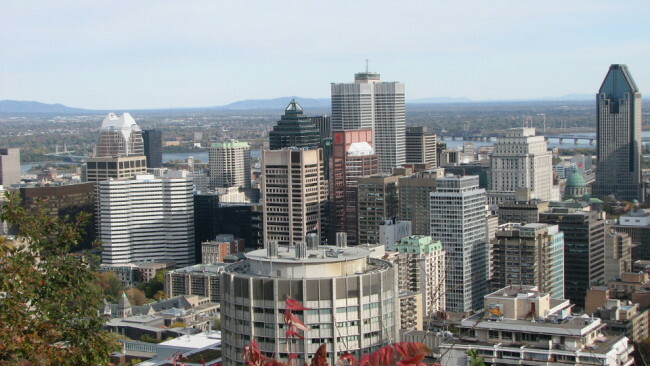 (Montreal is a derivation of the name Mont-Royal.) There are walking trails, cycling trails, and a great observation point on its southern slope. 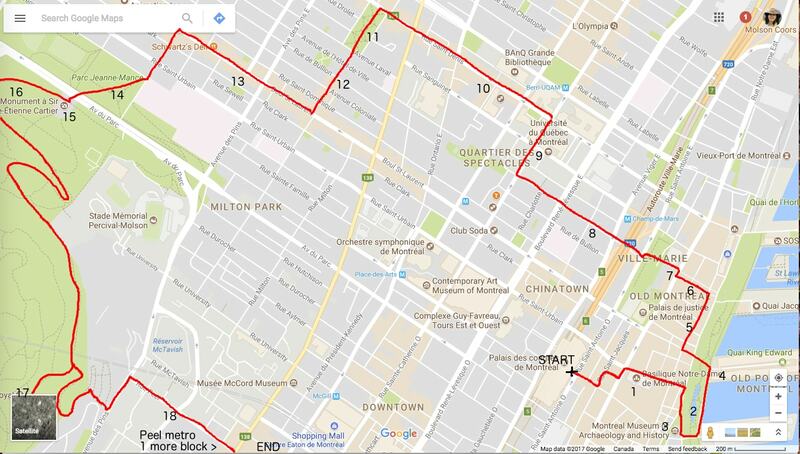 If you are getting tired and would like to shave a couple of kilometres off this walk, go north along Avenue du Parc (to your right as you face the monument) to the corner of Avenue du Mont-Royal Est, and take bus 11 (westbound) for three stops. Get off at Remembrance/Chemin du Chalet, and follow the signs to the viewpoint (a short walk). 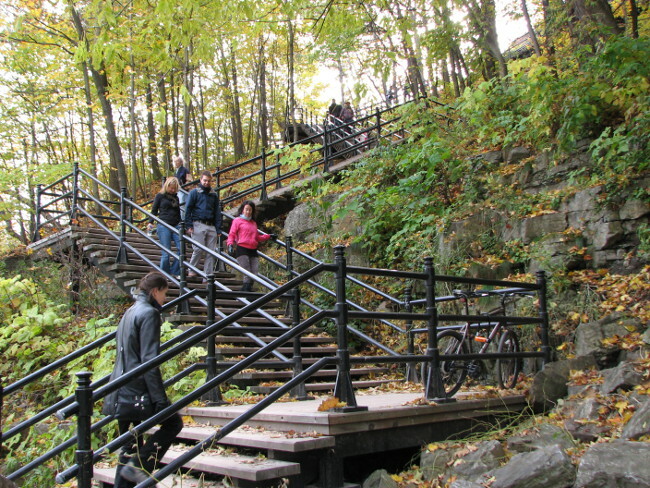 Otherwise, if you’re up for a nature walk, take Chemin Olmsted  to the right of the statue, which angles away from Avenue du Parc and slowly takes you up the side of the mountain through a few twists and turns, all the way to the staircase, a walk of about 25 minutes (2.2 km). Make sure you follow signs for “Chalet du Mont-Royal”, “Belvédère”, or “Point de Vue” (view point) . The big wooden staircase (Grand Escalier) has 340 steps and you’ll come across joggers and other athletes running up and down. If you don’t want to climb, you can keep following the road but this will add at least another 2.2 kilometres! Most of the mountain top consists of wooded areas, where the foliage turns beautiful shades of ochre, orange and red in the fall. Take your time and breathe in the clean air of this forest within the city. The natural promontory in front of the Chalet gives you an unobstructed view of the downtown core and the Saint-Lawrence River beyond. Once you’ve taken all your pictures (don’t forget to do some video of the panorama), head back downtown via the staircase. Get your bearings with this map (sorry, in French only). The bottom portion is especially useful. At the bottom of the stairs, take a right and follow Chemin Le Serpentin to Avenue des Pins Ouest (West). Take a left here, then a right onto rue Peel  which leads right into downtown Montreal. Walk down Peel and you’ll soon come across the Peel metro station, and then rue Sainte-Catherine Ouest with its many shops, restaurants, and entertainment. You could have dinner here if you want. This part of downtown becomes more anglophone as you keep going west. Intersecting streets such as Stanley, Bishop, and especially Crescent, are home to several nightclubs… in case you still have energy left. 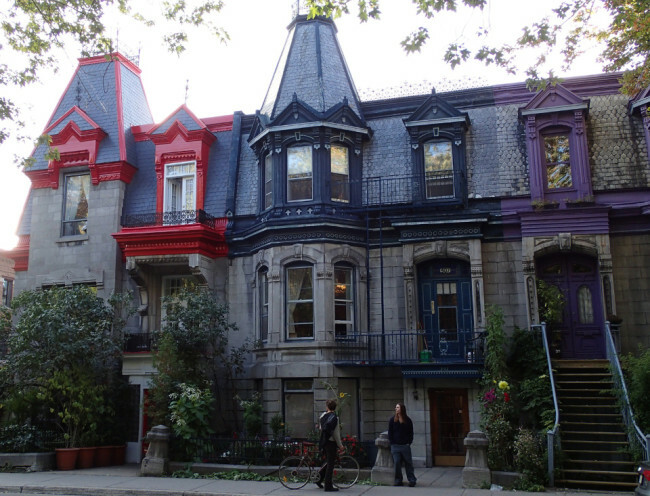 With a second day I would suggest exploring the trendy neighbourhood of Plateau Mont-Royal, the Mile-End, Jean-Talon Market, and Parc La Fontaine. But that will be another post! 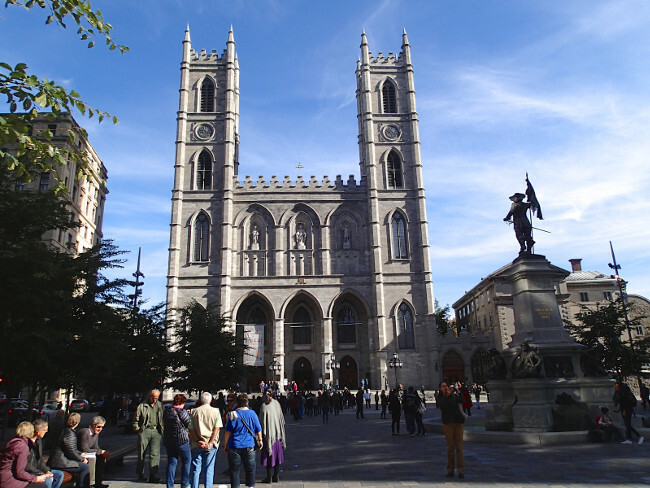 If you have more time in Montreal or would like to find out more about the attractions, I recommend Lonely Planet’s Montreal & Quebec City guide. It includes more city walks, and cycling tours too! If you need something even cheaper, AirBnB offers hundreds of rooms and apartments in Montreal that cost much less than a hotel room. If you’re not registered yet, get a US$35 (CAD$45) credit with the above link. 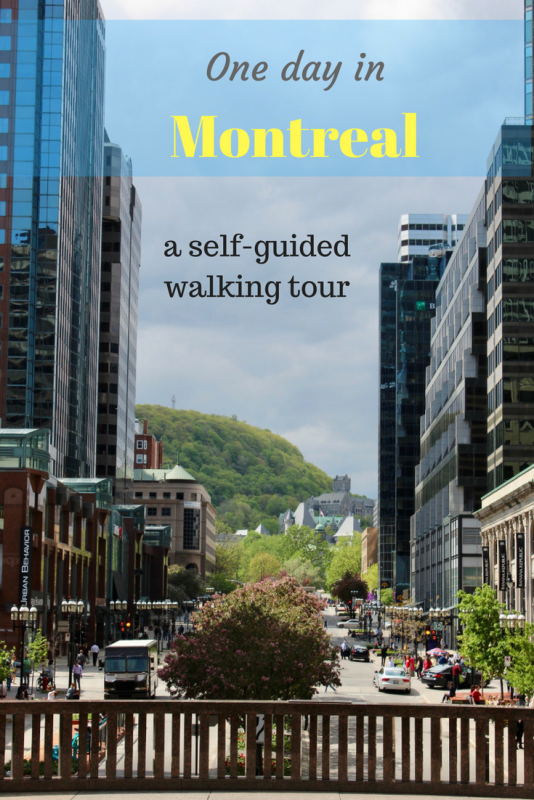 NOTE: If you’re planning to visit Montreal as part of a longer trip in Eastern Canada or North America, check out all these tours that include Montreal. Have you ever been to Montreal? Would you like to go? Great article! I love Montreal and would not live anywhere else. It is funny for me to read it because you did this walk right after we saw each other for brunch. That’s right! I only made it to Square St-Louis though, because I started so late. The rest was pieced together from previous visits. This is really a full-day walk! Thank you for the what looks like an absolutely wonderful itinerary for a one day walking tour. It is a ambitious packed schedule, but, that is what we like. It’s exactly what we were looking for as we love to explore new cities by foot. We are going to be in Montreal for 3 days, staying the the Village neighborhood and would love seeing your Second Day post. Thanks, again. Thx for the write up. I did pretty much everything in day one aside from going inside notre dame. Juliet et Chocolat was weird. They barely spoke English and wouldn’t let me eat my cookie inside. I guess you have to order from a menu to eat inside but I had no idea there was menus. Definitely lost in translation. Loved the maple place though and kinoya Izakaya was a great ramen place on the rue st denis. Schwartz’s smoked deli was definitely a good experience but can’t say I loved it as much as most seem to. At the end of the day, I went to mont royal. There was a party at the bottom of it I guess because it was Sunday and that was cool. Climbing it was a good way to end the day.